I still remember the first time I went to Phoenix Comicon. I’ve always been super geeky and had been wanting to go for a long time. In 2011 I finally got the chance and was instantly mesmerized. Not only did I get a chance to see icons like Wil Wheaton, Leonard Nimoy and Billy Dee Williams, but I truly felt at home surrounded by other people who geeked out about things the same way I did. Since then, cons have become a staple in my life. I find them an exhilarating and fun way to share my fandom. It’s terrifying to even consider the possibility that someone would want to do harm at an event like this. And even more terrifying when you hear the reports so close to home. The events of this past weekend have me thinking. A lot. Places and events like this used to be a safe place. A place where we could go to experience the fantastical and share our love of everything geeky. It hurts my heart to know a real life villain threatened our safety on Thursday. It feels like the end of an era and a loss of our innocence. I can’t stop thinking about this past weekend and have a compelling need to chronicle the events and share my perspective of everything. I was excited to attend all 4 days for the first time in quite awhile. I headed there Thursday morning and was able to immediately receive my badge. All was good in the world as I did my con thing. That afternoon I was checking Twitter and noticed a vague article alluding to an arrest at Phoenix Convention Center. I didn’t know all the details, but connected the dots and was pretty sure that it was PHXCC related. I quoted that tweet and said “Be safe, everyone at #phxcc”. 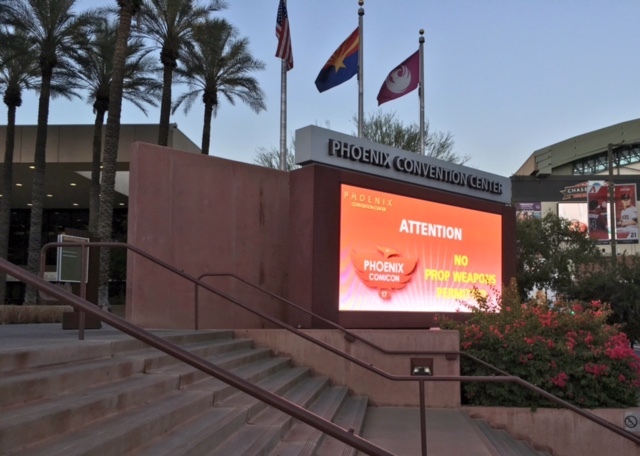 Then a few hours later we got an email from the Phoenix Comicon Staff stating that there would be enhanced security screenings at 3 access points, increased bag and wand checks and that “costume props” would not be allowed for the remainder of the convention. By this point we were learning more about the incident including the weapons involved. I knew this was big and it would certainly have an effect on the rest of the con, but I don’t think any of us were prepared for the chaos that was Friday morning. Phoenix Comicon attendees waiting in line outside the Phoenix Convention Center. As I headed downtown on the lightrail, there was definitely chatter on board. We knew what happened and honestly were still trying to process everything. We started getting closer to the convention center and noticed the throngs of people. 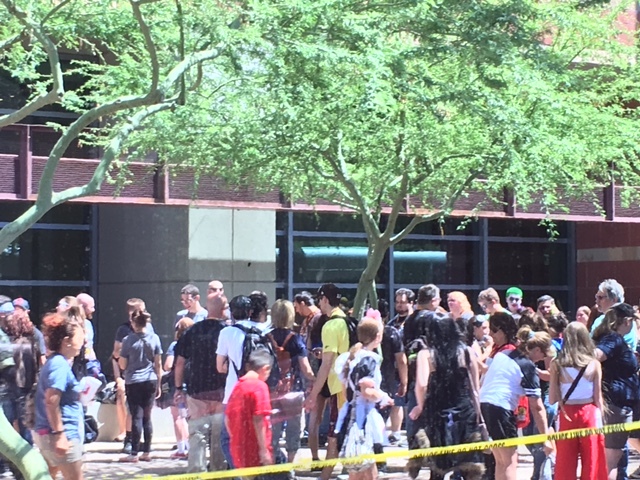 I don’t think I’ve ever seen that many people congregated in downtown Phoenix before! As we approached our station there were still people as far as the eye could see. We stopped, but the doors didn’t open. We were informed that we would have to disembark at the next station. So I headed towards the scads of people and found a line. It was mass confusion and there was no direction whatsoever. After standing in line about 15 minutes I realized I was in the wrong line! I was able to scoot over to the adjacent line and luckily only had to wait about 30 minutes more until I was inside. While we were waiting in line we got another email from PHXCC clarifying the ‘prop ban’. (Which some people were annoyed about because they were already at the convention.) As per the Phoenix Police no weapons or simulated weapons would be allowed. (Based on the previous email it seemed like NO props of ANY kind would be allowed.) People were still very confused at this point as to what constituted a simulated weapon. Especially when it came to the topic of lightsabers. And of course, there would be more lightsaber drama with the whole Ultrasabers debacle that would follow. I made it through security and the guard told me if I left the convention center I would need to go through security again. (This was a bit misleading as you were able to exit the one building and cross the barricaded area to the other side of the convention center.) After everything was said and done, things were running fairly smooth inside the convention center. I did, however, notice a certain melancholy among the guests. And rightfully so. We were still in shock about what happened. But geeks are resilient and we carried on. 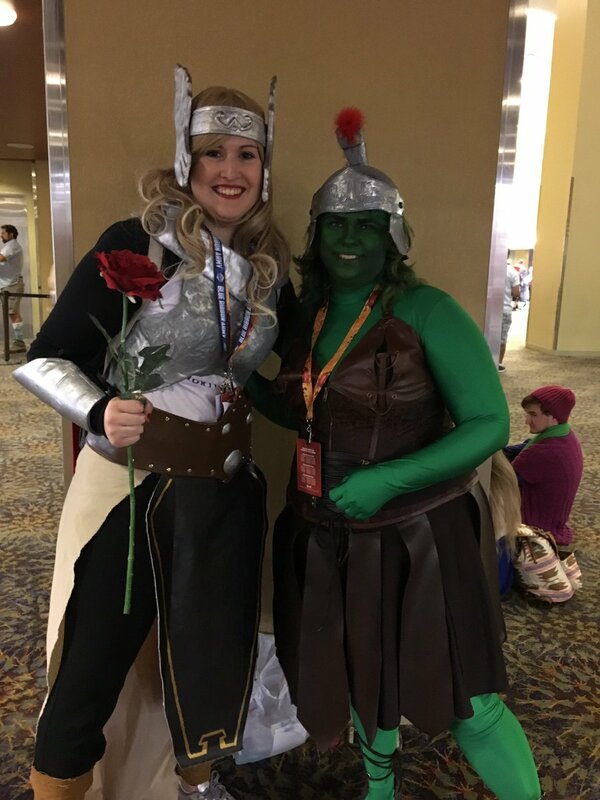 Cosplayers had to come up with last minute improvisations like this Thor who used a rose instead of a hammer. Saturday is also the day we were informed by Phoenix Comicon about the Ultrasabers situation. More drama to an already emotional roller coaster of a weekend! To summarize their press release, Ultrasabers would not comply with the mandate to wrap the sabers they sold and were asked to leave. Ultrasabers reps proceeded to print out fliers with their side of story and were handing them out at the con. This situation is unlike anything I’ve ever seen at con before! 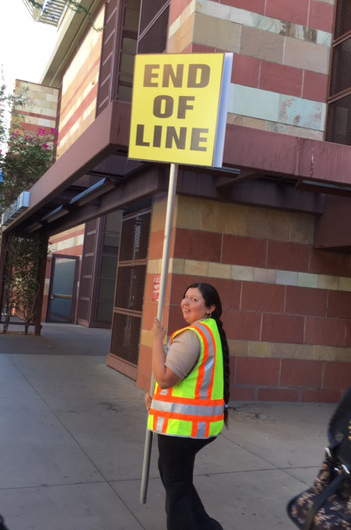 Lines were running much more smoothly by the end of Phoenix Comicon. I headed back to the convention on day 4 and was pleasantly surprised. The lines were the best yet and there was even a cheerful lady with an “end of line” sign to assist people. I waited 5 minutes tops and headed in the convention center. It was nice to see everyone in a much more relaxed mood and enjoying the con. I went through the final day of the con somewhat more exhausted than normal, but also extremely grateful that it went as well as it did. We live in scary and uncertain times and sadly I feel like this is a turning point for events like this. Going forward, I predict much higher security measures will be enacted in order to keep everyone as safe as possible. I feel like one of the most frustrating aspects of this whole incident was the lack of communication. I feel like a simple explanation regarding the severity of the weapon prop ban would have really helped people realize why it wasn’t a good idea for any simulated weapon on site. And let me just say, I am truly grateful to the staff of Phoenix Comicon, The Phoenix Convention Center and The Phoenix Police for keeping us safe. So thank you. You truly are real life heroes! Like I said, nerds are resilient. Let’s all remember that ultimately it’s the people who make comicon great. So no matter what obstacles or restrictions we face in the future, let’s keep that geeky, awesome, creative spirit!